I have been interested in Permaculture for a few years now, and have recently been trying to apply it more readily in my daily life. I feel permaculture principles offer a positive alternative to the corporatist, capitalist, anti-nature and neo-con version of the how we live on the planet. And with the dual threats of climate change and peak oil, permaculture seems to offer very practical and positive ways in which we can meet these challenges. Importantly, the principles can be applied whether you live in an university city such as Oxford, in a village under occupation such as Beit Sahour in Palestine, or a primary school in Malawi. I've been wanting to undertake the full Permaculture Design Course for a while, but they have always been somewhere else, which means that beyond the course fee you have the added expenses such as travel and accommodation. 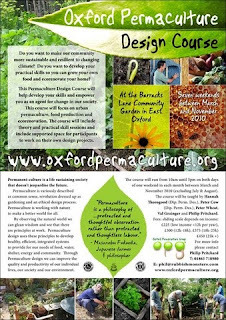 Lucky for me, and everyone else in the Oxford area, the Oxford Permaculture Group are running a full design course in 2010. Yay I say. The Oxford course will focus on urban permaculture, food production and ecorenovation. I'm particularly interested in urban permaculture as most of us will never be able to 'escape to the country' so I think it will be really useful to be able to apply permaculture skills in an urban context. The other useful thing about the Oxford course, is many of the full courses run over a 2 week period, which is not always easy to fit in around the rest of life. The Oxford course will run over 7 weekends throughout the year beginning later March, so I can fit it around work (well, job hunting! ), my allotment and garden, WDM campaigning, and still have time for Kevin, Merlyn and my lovely friends*. Once you have undertaken the course, you can then go on to undertake the Diploma in Applied Permaculture Design, something I might want to do at a later date. *oh, and baking too. Must have time for baking. yum.